When I started this painting, using a wet-into-wet technique, I assumed that the focal point would be the flowers... but as the process unfolded, it became clear that the star of the show is the blue glass vase. 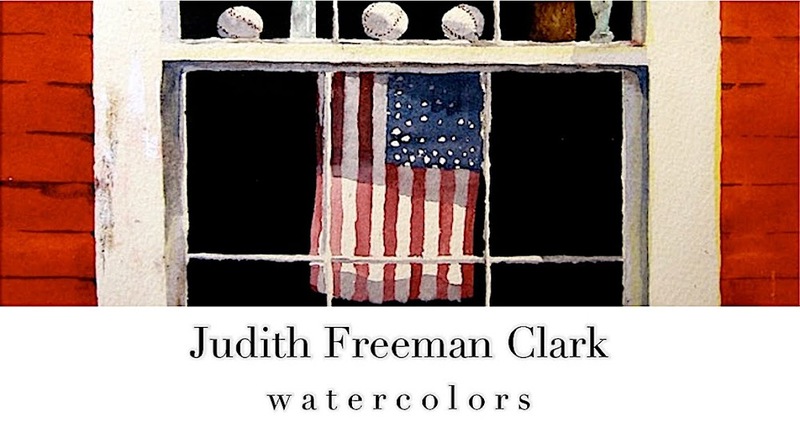 Painting glass in watercolor can be a challenge because of the need to preserve highlights. To begin, I dampened the paper (I chose a piece of 300-lb. Kilimanjaro Bright White for this painting). I dropped color into the center area for the foliage, using Winsor & Newton Green Gold, Holbein Shadow Green, and Daniel Smith Undersea Green. 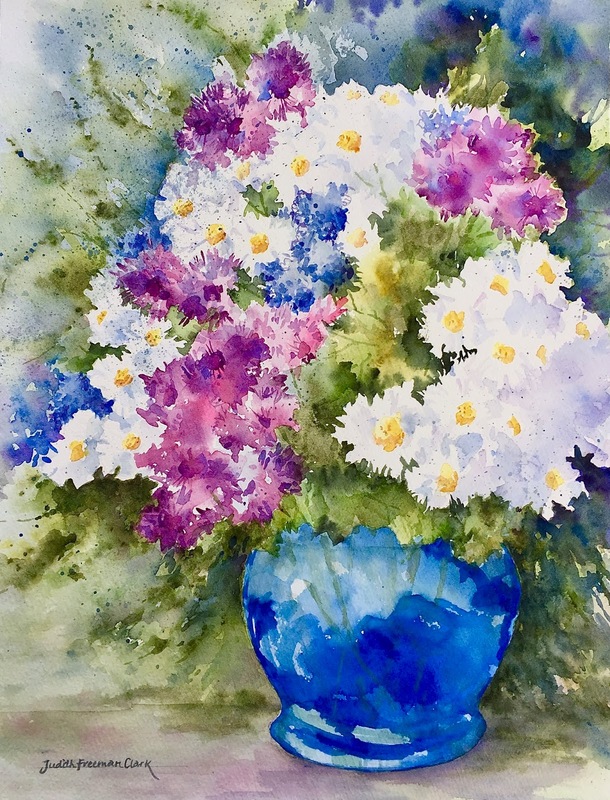 As I added color, I used a negative painting technique, going around the shapes of the white daisies. 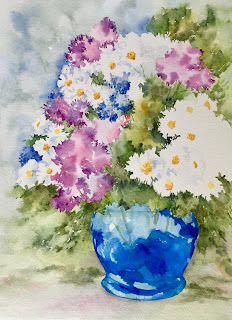 After this step dried, I added washes of bluish-gray (a combination of Shadow Green and Daniel Smith Cobalt Blue), further outlining the shape of the daisies. Before beginning work on the vase, I experimented on scrap paper with pigments. I wanted to make the glass vivid, so that it would stand out despite the proliferation of flowers and foliage. 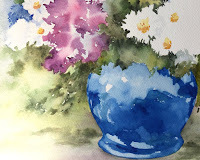 To obtain a really bright blue, I mixed Cobalt Blue with Winsor Blue (GS) and Winsor Blue (RS). 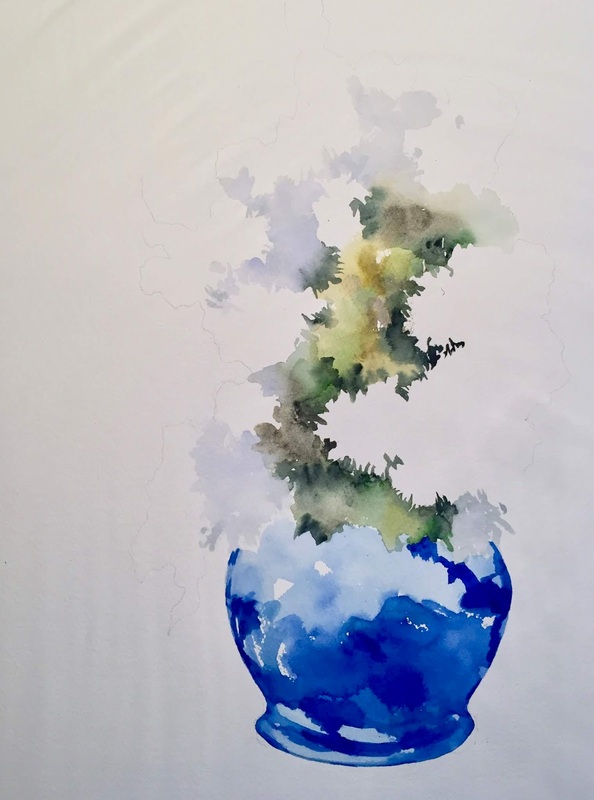 I preserved highlights in the glass by leaving some of the white paper showing, and I also put in a thin wash of both Winsor Blues (GS and RS) for emphasis. I didn't plan these steps ahead of time -- it was entirely an intuitive process. 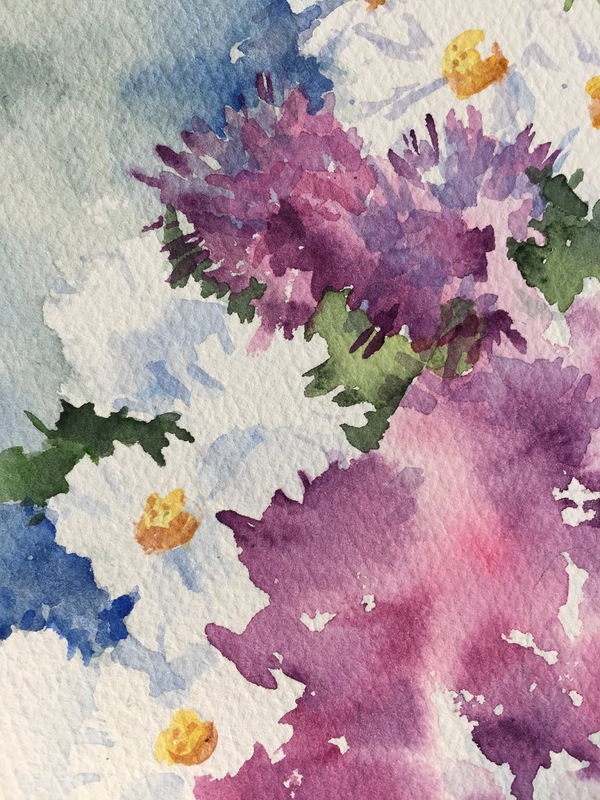 The flowers emerged slowly, as I dropped in color wet-into-wet, and also painted around the flower shapes. The purpose flowers were done with a combination of Winsor & Newton Mineral Violet and Permanent Rose. When the blossoms were dry, I painted the yellow centers of the daisies, using Winsor & Newton New Gamboge. After the daisy centers were dry, I used a wash of Burnt Sienna to add shadows. Once the flowers areas were complete, I built up the vase. 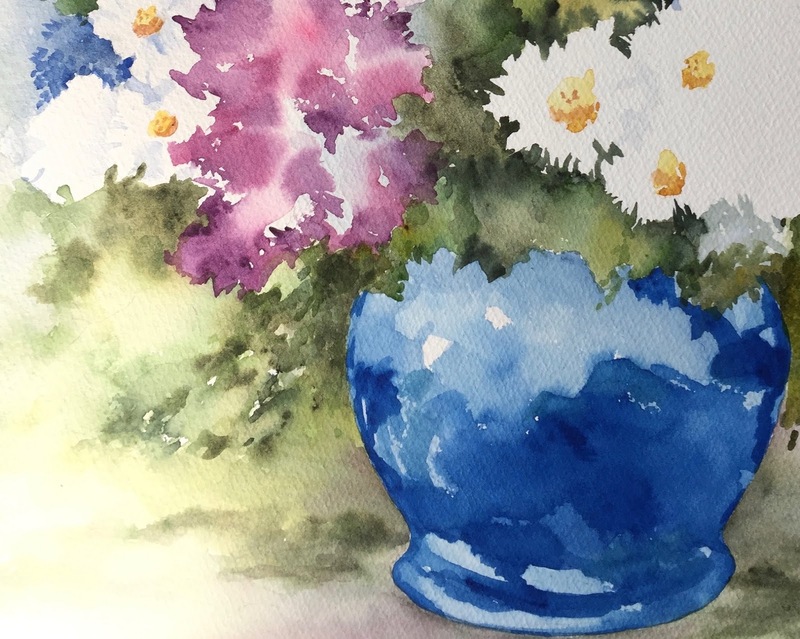 I worked around the vase, painting the background with multiple washes. 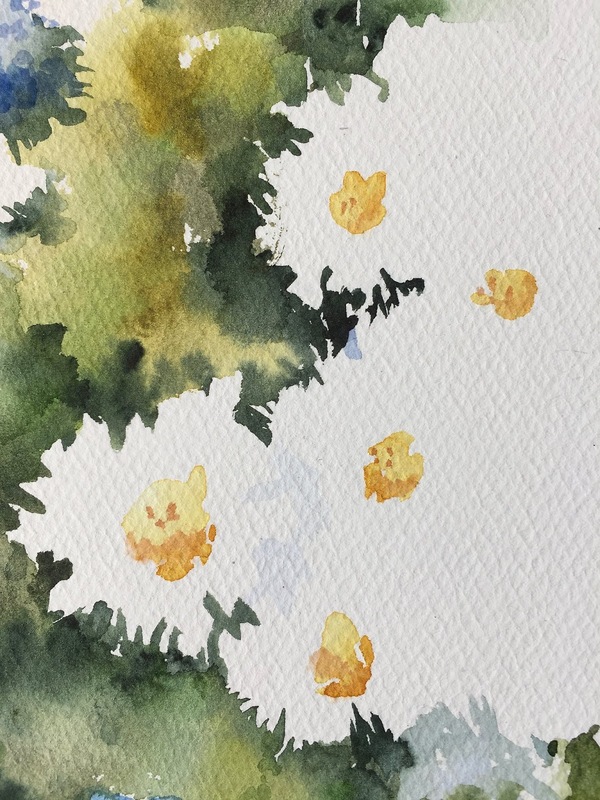 To soften some areas of the background, I washed over them with clear water, which lifted some of the pigment and let it settle into the paper. 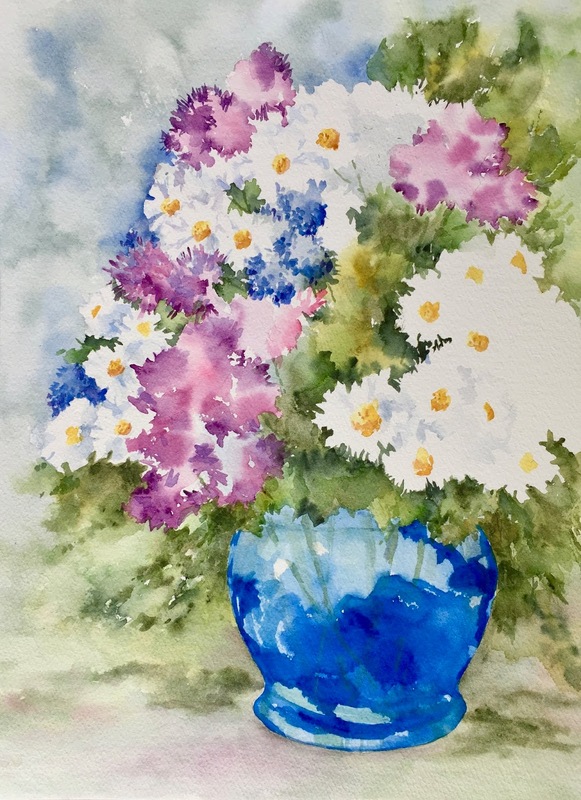 In the final stages of this painting, I deepened the color of the upper- and lower-right corner, dropping Winsor & Newton Dioxazine Violet, French Ultramarine, and Winsor Blue (GS) into the damp background. 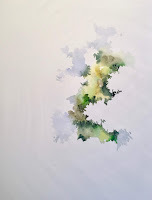 I also added some fern-like fronds on the left side of the painting, using a small brush and dotting the damp paper with Daniel Smith Undersea Green.